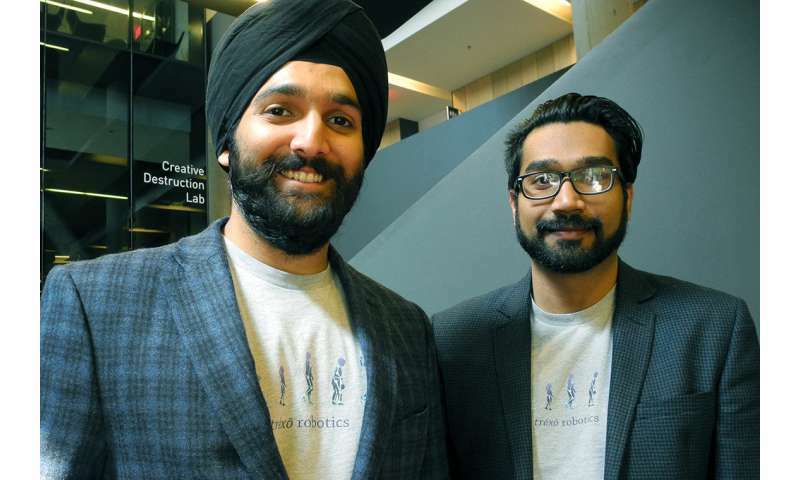 Co-founders Manmeet Maggu and Rahul Udasi this week took first prize in a pitch competition organized by the philanthropic arm of Sunnybrook Hospital in partnership with U of T's Health Innovation Hub, or H2i, incubator, among others. The judges, including representatives from private equity funds and medical device companies, were won over by Trexo's vision to help children suffering from disabilities escape life in a wheelchair with a walker-like device equipped with robotic "Iron Man" leg attachments. "The prize is going to be really helpful in enabling us to reach a commercial point," said Maggu of the roughly $35,000 that Trexo will take home. "The next batch of products we make, I'll be taking one back to India for my nephew." That would be nine-year-old Praneit, who suffers from cerebral palsy and inspired Maggu and Udasi to build a robotic exoskeleton prototype while studying engineering at the University of Waterloo. The idea ultimately led to the launch of a promising startup after the pair arrived at U of T, where Maggu did an MBA at the Rotman School of Management and Udasi completed a master's in engineering. In the summer of 2016, Maggu and Udasi packed the prototype exoskeleton in a suitcase and flew to India to visit Maggu's brother, his wife and Praneit, who tried out the device in the middle of the living room. "Watching Praneit take his first steps using our device was an incredibly proud moment for us," Maggu told U of T News back in June. Trexo's evolution from cool technology to promising startup is a case study in the advantages of launching a startup at U of T. Over a period of just 24 months, Maggu and Udasi drew on the resources and multidisciplinary expertise of no less than four U of T entrepreneurship hubs to help get Trexo off the ground. They were: H2i, the Entrepreneurship Hatchery, the Department of Computer Science Innovation Lab (DCSIL) and the Creative Destruction Lab (CDL). "Our product is really unique," said Maggu. "There's a health care aspect, computer science and the engineering, so we benefited a lot from being involved with all these different accelerators at U of T."
Following Trexo's completion of CDL's rigorous nine-month program earlier this year, Maggu and Udasi left to participate in New York's Techstars IoT accelerator program, which Maggu says helped to further fine-tune Trexo's business plan. It also helped open doors in the huge U.S. market – including at the Cincinnati Children's Hospital Medical Center. "They saw our device and were really excited about it," said Maggu. "We're planning to start pilot studies with them early next year. "It's the largest children's rehabilitation program in the United States, so getting recognition from them was really amazing for us." A fall left a man paralyzed. Now a robotic 'exoskeleton' lets him walk again. More research should be oriented towards helping people with disabilities, instead of military applications.